"Your touching story put a lump in my throat, a tear in my eye and a yearn in my heart. What would you do if you were given a second chance? Lee is given 3 days to convince his younger self to correct his biggest regret in his un-fulfilled life. A love story than spans 40 years. The story is based on the 1990's TV show, "Twice in a Lifetime"
Lee Robinson has been upset during the past few years. He’s had one failed marriage and the current one isn’t going all too well either. He hasn’t had full time work in about eight years. Lee has been substitute teaching for most of those years and also working at WalMart. His wife has stated that he needs to do as she says or he’ll have to leave. He has been praying about everything in his life: his marriage, finances and the past, which he can’t change. Only if he could. Lee has only has one regret in his life. Her name was JoAnne. The one person that he felt like he loved with all his heart. The one person he still really cared for. The one person that he feels he let down. But, also, she was the one he never really knew. How does somebody change that one regret? The only problem was that she passed away 42 years ago. You see, Lee never really had the chance to go out with her. He remembers that he asked her out three times while in jr. high and high school before she got sick. Plus three times also after she got sick. She told him at that time she liked him but she didn’t want him to get hurt since she was sick. She also said that she would be praying for him every day. Lee remembers when he first heard JoAnne was sick. He was heartbroken. After he heard about it, he got as much information that he could about her and leukemia. When she passed away, he was so upset he couldn’t even go to her funeral. He used the excuse that he was in college, even though her funeral was on the weekend. Lee eventually married into an abusive marriage which lasted about 22 years. They adopted a son, named Caleb, who is now away at college. After a tough day of substitute teaching, Lee decided to go jogging. At 62 years of age, he has kept himself in shape over the last 30 some-odd years. He had noticed quite a few people his age looked like death warmed over. But that was them. Lee thought it was best to take care of himself. It was tough, but he did without fail. It was a very warm day and a little cloudy, but it didn’t look like it would rain, so Lee decided to go on his usual 3 mile run/walk along Fountain Creek near Colorado Springs. About halfway through his run, it started to really cloud up Then it got very windy and started to rain. He was out in the middle of a field when it started to lightning. That is some place he didn't want to be. Lee had a slight case of Astraphobia (abnormal fear of lightning) when he almost got hit by lightning back in 1995. That year, he was on the back porch of his home in Florida and a tree was hit 20 feet from where he was standing. The lightning also blew out a few things in his house. So, Lee decided to turn back and start to look for some shelter. He saw another runner who didn’t seem too concerned about the storm. Lee started to run towards a nature center, which was about 200 yards away. Then, all of a sudden, lightning struck near his foot and knocked him about 20 feet in the air and Lee fell on his back. While laying there, Lee sees the same young man standing over him.. He was about 6 feet, 160 pounds. Suddenly, Lee is in a castle-like area; dressed in the same shorts and t-shirt when he was running. “What Judge? What charges?” asked Lee. “Really? You're kidding? Who in the heck are you?” asked Lee. “And how did I do? Lee asked. The judge shows some video of JoAnne, alone, in her hospital room, sick, receiving treatment, and looking very discouraged. Lee was almost in tears. “What words? I didn’t know what to do. I wish I had done more. Lee seems a little sceptical “How can that happen? Lee gave Mr. Jones a doubting look. “It can be...It all depends on you”, Mr. Jones said. The gavel slams down and Lee is somewhere that looks familiar but is unsure...at first. Why, it’s Lee’s old high school in Florida. Around 1970...71. A lot of memories. Both Good and bad. Got in trouble in school a couple of times. Talked a lot in class. Even got kicked out of Biology class for a couple of days. Some of the other kids were throwing things at him and then he threw one of the items back, but it hit the teacher instead. Lee really didn’t do all that well in high school overall. He was ranked 400 out of the 600 graduates. But, he was able to go to college. Lee sees Mr. Jones in the mixed of things. It’s about 8:00 and school hasn’t started yet. Students are just starting to arrive. School starts in about 20 minutes. James/Lee turns around and sees JoAnne right in front of him. His heart nearly skips a beat. It turns out that she is his ambassador for his first day of school. She will be showing him around and where all his classes are. She is just as beautiful as he remembers. And...a little chattier than he remembered. Lee responded awkwardly, “Uh, my dad worked at NORAD as an artist. “I do. But, I’ll be gone for about two weeks and they really don’t want to be gone that long from school. Oh, I understand that, but it gets so lonely up there with just my family. I love them and I know they're doing their best, but they’re just worn out right now. God, I've been praying for a friend to lean on. Well, she took him to his classes each hour until lunch when she went to the McDonald’s across the street. He ate in the cafeteria since Mr Jones and the Judge didn’t give him enough money to go with JoAnne. While getting his lunch, he notices his young self and decides to approach him. After lunch, James/Lee met up with JoAnne and they started walking towards his next class. Jim just realized that he gave them the same advice. At the end of the day, Jim/Lee thanks JoAnne and then sees his younger self sitting on the bench waiting for the bus. Jim just happens to remember his old bus schedule after all these years. “I don’t know. I'm a little nervous about talking to him. What do I say? JoAnne then goes over by young Lee and they start chatting. Over the next 10 minutes, they chat about a variety of subjects including when she was cheerleader and when he tried out for football in Jr. High. Lee says, "I tried out for football trying to impress you and your friends. I was wondering if it worked? JoAnne shakes her head, "Not really. We were just wondering why you were trying to get yourself killed." They both laughed about that and other things that they talked about.. The subject then switches to her bout with leukemia. Remembering what Jim said, JoAnne smiled, but was just a little reluctant. Lee is wondering how she knows what his grades are like. JoAnne was excited and surprised. Well, they both went home and talked to their parents. After they convinced them about having chaperones at the hospital and that the two of them would study, everybody seemed ok with it. JoAnne’s folks were relieved since they would be getting the help and relief that they need.. The next day Lee and JoAnne got together and talked. “Uh oh. Just one?...What is it? JoAnne gives him a big grin. She doesn’t know what to say. She then starts tearing up and steps over to Lee and gives him a big hug. JoAnne then kisses him tenderly on the cheek.. They both laugh. After Lee kisses JoAnne back, there is suddenly a white flash and he ends up in a new location. Whoa, Lee is startled and is wondering what’s going on now. Nurses are examining him and giving him an I.V. Is this from the lightning strike? Was everything...just a dream? “Where did this blood come from?” Lee says to himself. Lee was in the emergency room from a gunshot wound. Nurses were tending to his wounds and reassuring him. Then another nurse shouted to the doctor on duty. Dr. Robinson then looks at Lee, “Oh, my god, Babe. What the hell happened to you? After she gets her composure, JoAnne gets on the phone and calls another doctor to operate on Lee. She then heads out to the waiting room to be with Lee’s co-workers from the local Colorado State Patrol post. She is in shock and close to tears. As she wipes her face she tells them what is going on. The Troopers were a little confused because most of them have not met her and didn’t even know she was a doctor. After she introduces herself, they give her a hug of support while they wait for the surgery to finish. Over the next few hours, she tells them about their life together during and since high school, her battle with Leukemia, their first kiss, and their first date, which lasted two weeks. A few hours later, Lee was in recovery by himself. There was a trooper watching outside his room while his wife was talking to the nurse. Mr Jones appears to him at the end of the bed. Lee lets out a soft laugh and moan, "I guess I said the right words?" “You will. You’ve been one for about 40 years. Right before you and JoAnne got married. First, in Alabama as a trooper so she could go to medical school. Then back to Florida where she opened her practice and you were an officer with the Florida Marine Patrol. That was a very interesting 20 years for you. Now, you’re in Colorado, again as a trooper. JoAnne opened a new practice here in Colorado Springs. She really supported you in your pursuits and you really helped her and encouraged her when she got her medical degree. “They both found somebody that makes them very happy. They won’t remember you, and you won’t remember any of that life either. It may seem like a distant dream. The new memories you have will be the ones from this life. And, sad to say, you won’t remember me either. There are a lot of people across the country praying for you and wishing you well. A lot of them are here too, waiting outside. The next day Lee is now in a hospital room recuperating. His wife and kids are now in the room with him. Caleb came from Greeley to be with them. “It just might be a little longer. “When you get better, we’ll have that dance. OK? Tears started going down Lee’s and JoAnne’s faces. JoAnne lies down on the bed and kisses him on the cheek. You can tell that they have their parents sense of humor. After 5 months of recuperating, Lee and JoAnn decided to renew their wedding vows in front of their friends and proclaim their love to each other. It has been nearly 40 years. Everybody was there; kids, family and coworkers. This was a new start for them. A month later, Lee is getting ready for work for the first time since the shooting. Lee finds one of his favorite songs, “The Dance” and plays it on his phone. It was one of the songs they used to danced to in the kitchen when it first came out in the 90’s. 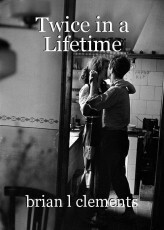 As they danced in the kitchen, they started to reminisce about their life together.. Afterwards, they sat down in the dining room. © Copyright 2019 Brian Lee Clements. All rights reserved. I must be honest I didn't intend on reading the whole story since I thought I didn't have time but I could not take my eyes off. It was refreshing and inspiring. Love it! Oh my god this is so sweet and heartwarming, its surprising how one litle change can make all of that difference. Wonderfully wrote! This was excellent. The more i read it the more interesting it became. Thumbs up! - Coming back to change things we would have like different in our life - There exists people unfortunate enough to wish to be given another chance to realize what they failed to achieve in their life. As en example of such, this fantasy sure hit its target, that his to move its audience. I like the denouement. This girl sick with leukemia that die for lack of a friendship and who survive because she has found love and the crucial comfort and assurance that comes with it. Well done. Since it was so good, and I don't know what to say, I'll just say this: wjofgkjsdfvnmnvksdhgsokdjfhksnkmcskdfnlkdfnggbgff,lfvjcfjfvjvfbgnhnh. Your touching story put a lump in my throat, a tear in my eye and a yearn in my heart. Chapter 1 - It went viral?